Parts hoppers, also called parts storage hoppers, are an important part of an automation system. Parts hoppers are used to store the bulk components that feed into a vibratory feeder bowl and to maintain a constant level of those parts in the bowl. Our parts hoppers are custom manufactured in-house out of hot rolled or stainless steel. Medical and food grade steel is available. Parts hoppers can also be tooled to feed a simple part with minimal orientation. 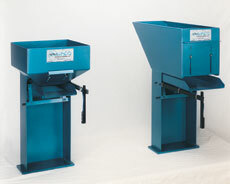 Dial-X Automated Equipment, Inc. parts hoppers are available in 1 to 6 cubic feet capacities. For further information or a free quote on parts hoppers, contact Dial-X Automated Equipment, Inc.